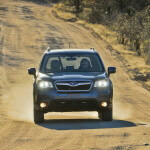 The 2014 Subaru Forester is an all-wheel drive compact crossover SUV that is completely redesigned for 2014. 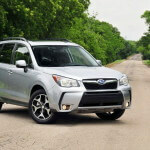 This fourth-generation Forester is now 1.4 inches larger, 0.6 inches wider and 1.3 inches taller than the previous model, and also has a 0.9-inch longer wheelbase. 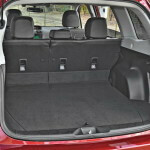 The interior volume of the new 2014 Forester has increased to 113.1 cubic feet, from 108 at the previous model. 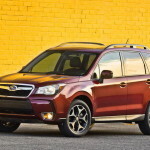 The new 2014 Subaru Forester offers a controlled ride and accurate steering and also has anterior that is built with quality materials and gives more cargo space than most affordable SUVs (74.7 cubic feet with the rear seats folded). 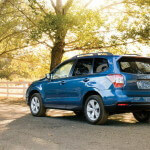 The 2014 Subaru Forester competes with Ford Escape, Mazda CX-5, Honda CR-V and Toyota RAV4. 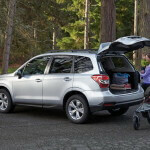 The 2014 Subaru Forester is offered in six trim levels: 2.5i, 2.5i Premium, 2.5i Limited, 2.5i Touring, 2.0XT Premium and 2.0XT Touring. 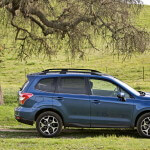 The Forester 2.5i comes standard with 17-inch steel wheels, cruise control, cloth upholstery, outside temperature display, full power accessories, a height-adjustable driver seat, a tilt-and-telescoping steering wheel, Bluetooth connectivity and a four-speaker audio system with a CD player and iPod/USB interface. 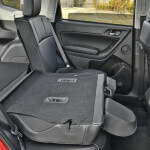 The Forester 2.5i Premium adds 17-inch alloy wheels, dark tint privacy rear glass, reclining rear seatbacks, roof rails, a panoramic sunroof, a rearview camera, a multi-function display, an eight-way power driver seat and a 6-speaker sound system. Heated front seats, heated mirrors and a navigation system with 6.1-inch touchscreen display and voice controls are available as options. The 2014 Forester 2.5i Limited comes standard with all standard and optional features of Premium model, plus automatic headlights, automatic climate control, a power rear liftgate, fog lamps, chrome exterior trim, leather upholstery, an upgraded instrument cluster with LCD, leather-wrapped steering wheel and shifter and a new X-Mode, which adjusts the suspension for slick conditions. The 2.5i Touring adds upgraded gauges, dual-zone automatic climate control, auto-close and memory functions for the power liftgate and an 8-speaker audio system. The Forester 2.oXT Premium comes withh all equipment of the 2.5i Premium and adds 18-inch alloy wheels, a rear roof spoiler and a more powerful engine. 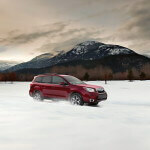 The 2.0XT Touring is identical to the 2.5i Touring, except the engine. Keyless ignition, keyless entry, xenon headlamps, cruise control and lane departure warning are available as options. 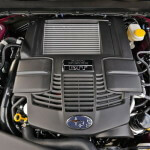 All 2014 Subaru Forester 2.5i models come with a 2.5-liter DOHC aluminum-alloy 16-valve horizontally opposed 4-cylinder SUBARU BOXER engine that produces 170 hp and 174 pound-feet of torque. A 6-speed manual transmission is standard, while a CVT is optional. Both 2.0XT models come with a 2.0-liter DOHC direct-injected turbocharged 4-cylinder BOXER engine that produces 250 hp and 258 lb-ft of torque. 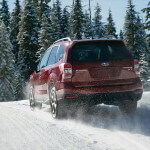 2.0XT models come only with the CVT. 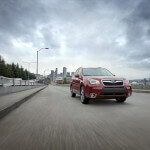 All 2014 Subaru Forester come standard with all-wheel drive. 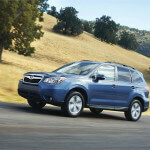 Safety features of the 2014 Subaru Forester include ABS, traction control, stability control, side curtain airbags, driver’s knee airbag and front side airbags. 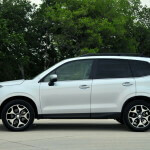 More refined, more practical and more appealing than before, and with EPA-rated fuel efficiency competitive with most front-wheel-drive competitors, this new 2014 Forester compares well with Ford’s Escape, Mazda’s CX-5 and even segment leaders Toyota RAV4 and Honda CR-V. It’s name is indicative: Forester does really well in the forest, where Subaru’s superb all-wheel drive and balanced handling are perfectly suited to slippery conditions and winding roads. 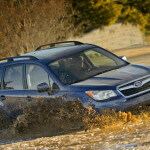 Posted on March 13, 2014, in 2014 Car Models, Subaru. Bookmark the permalink. Leave a Comment.